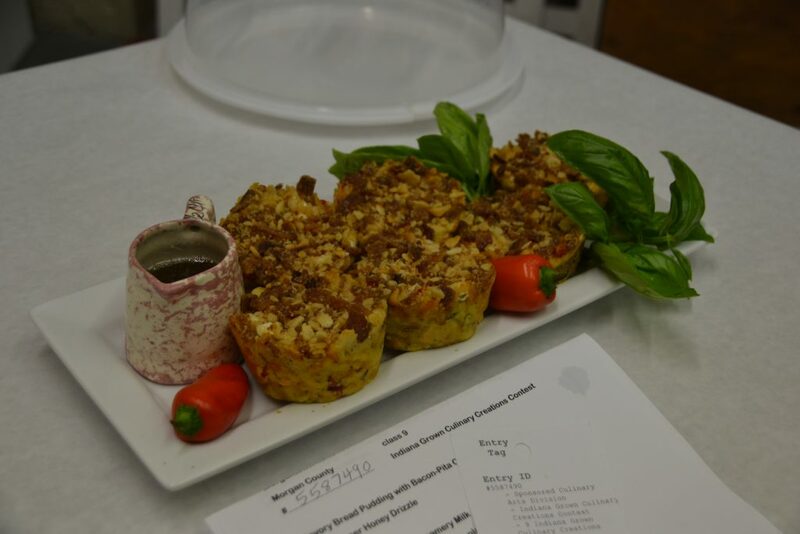 This tasty finger food made its debut at Indiana Grown’s culinary competition. Its unique flavor and homegrown ingredients make for a great addition to your next dinner party! In a large bowl, combine milk, yogurt, eggs, oil and basil. Add bread and toss to coat well. Allow to set for 30 minutes, tossing occasionally. Fold in knobs of goat cheese, cheddar cheese, scallions and bell pepper until evenly mixed. Spoon mixture equally into (8) greased non-stick mega muffin cups. Combine crushed chips and bacon. Spoon on top of mixture in each muffin cup. Bake for 30-35 minutes or until lightly browned on top. Combine honey and black pepper. Drizzle over top of each serving. Makes 8 individual bread puddings.